Dr. Eisele was born and educated in Germany and grew up in Berlin. She studied Physics at the Technical University of Berlin, Germany. In Dec. 2009 she received her doctoral degree, Dr. rer. nat. (PhD equivalent), in experimental physics from the Humboldt University Berlin, Germany, in close collaboration with Prof. David A. Vanden Bout (Chemistry Department of the University of Texas at Austin, USA). From March 2011 till August 2014, she conducted her research projects as a Postdoctoral Associate at the Center for Excitonics of the Massachusetts Institute of Technology in the research groups of Prof. Moungi Bawendi and Prof. Keith Nelson. In 2011, Eisele received the prestigious Feodor-Lynen Award and became a member of the Alexander-von-Humboldt-Foundation. In September 2014, she joined The City College of New York (CCNY) of The City University of New York (CUNY) as an Assistant Professor of Physical Chemistry. Dr. Leishman grew up in Albuquerque, New Mexico. He studied physics and applied math at the University of New Mexico, where he became fascinated with quantum dynamics in biological energy transport processes. After graduating, he moved to Oregon, earning an additional bachelor’s degree (Chemistry) at Portland State University while performing computational modeling of sensitizing dyes and photoactive polymers for solar cells in the research group of Prof. Carl Wamser. In July 2016, he earned his Ph.D. in physical chemistry from the Department of Chemistry of Washington State University in Pullman, Washington, under the mentorship of Prof. Jeanne L. McHale. In his doctoral research, he coordinated resonance Raman spectroscopy with nanoscale imaging to distill insights into relationships between structure and optical properties of supramolecular porphyrin aggregates. He published the findings from these investigations in an interlinked series of three first author papers. Dr. Leishman joined Prof. Eisele’s research group as a postdoctoral researcher in September 2016 at the City College of New York, where he is working on structural and optical studies of energy and charge transfer dynamics in composite nanoscale systems including hybrid excitonic and plasmonic materials. He is driven by a vision to engage cutting-edge optical spectroscopy, microscopy and theoretical investigations to enable future advances in sustainable energy. Dr. Nikunjkumar Visaveliya was born in Devkigalol, India. He earned his B.Sc. in Chemistry and M.Sc. in Organic Chemistry both at the Sardar Patel University, Gujarat, India. After completing his M.Sc., he moved to National Chemical Laboratory, Pune, India where he worked as a research project assistant under Dr. BLV Prasad on the synthesis of different bio-surfactants and their applications. He then joined Prof. J. Michael Koehler’s group at the Technical University of Ilmenau, Germany in order to obtain his PhD. In Prof. Koehler’s group, Nikunjkumar gained extensive expertise in state of the art microfluidic nanosynthesis. He applied these microfluidic techniques to synthesize different types of multi-functional nanoparticles (organic as well as inorganic) with a wide variation of parameters such as size, shape, assembly, and composition for different functional applications. During his PhD career, Nikunjkumar published 17 manuscripts in peer reviewed journals, of which he is first author of 11 publications. In November 2016, Dr. Visaveliya joined Prof. Eisele’s research group at the City College of New York as a postdoctoral researcher. His research interests concern nanomaterials for light-matter interactions. Specifically, he is interested in utilizing microfluidics for supramolecular self-assembly as well as for polymeric nanomaterials and novel nanocomposites for optical and biomedical applications. Nikunjkumar is passionate about pushing microfluidics forward to new frontiers. N. Visaveliya and J. M. Köhler; “Microfluidic Assisted Synthesis of Multipurpose Polymer Nanoassembly Particles for Fluorescence, LSPR, and SERS Activities”, Small, 11, 6435–6443 (2015) (Inside Cover Article). N. Visaveliya, S. Lenke and J. M. Köhler; “Composite Sensor Particles for Tuned SERS Sensing: Microfluidic Synthesis, Properties and Applications”, ACS Appl. Mater. Interfaces, 7 (20), 10742-10754 (2015). Kara grew up in Brooklyn, NY. In February 2015, she received her bachelor’s degree from The City College of New York with a major in environmental chemistry and received the Benjamin Harrow Memorial Award for undergraduate research. Kara also received The Division of Science Fellowship to work with the U.S. Geological Survey at the New Jersey Water Science Center, where she analyzed the occurrence and distribution of contaminants along the New Jersey coastal sediments. Kara’s interest in interdisciplinary fields of chemistry and environmental science led her to pursue graduate research. In September 2015, Kara entered the Ph.D. program in Chemistry at the City University of New York (CUNY) under the supervision of Prof. Dӧrthe Eisele, Dr. rer.nat. Kara’s research interest is in the fundamental science of energy transfer in self-assembled nanomaterials (i.e., supramolecular aggregates, hybrid organic-inorganic nanomaterials) with the goal of guiding rational design of innovative next-generation solar cells. 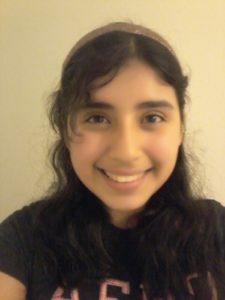 Her dissertation is focused on understanding the subtle structure-property relationships of energy transfer mechanisms using a combination of spectroscopic and ultra-high resolution microscopic techniques. Meuhlethaler, C., Ng, K., Gueissaz, L., Leona, M., Lombardi, J.R., Raman and SERS characterization of solvent dyes: An example of shoe polish analysis. Dyes and Pigments 137: 539-552 (2017). Ng, K., Belh, S., Chowdury, A., Yehya, N., Patel, M., Huffman, G., Eisele, D.M. Near-field scanning optical microscopy investigations of individual supramolecular light-harvesting nanotubes. Poster session presented at the 252nd American Chemical Society National Meeting & Exposition, August 21-25, 2016, Philadelphia, PA. Ng, K., Szabo, Z., Reilly, P.A., Barringer, J.L., and Smalling, K.L., An assessment of mercury in estuarine sediment and tissue in Southern New Jersey using public domain data. Marine Pollution Bulletin 107: 22-35 (2016). Pooja grew up in Mumbai, India. She completed a Bachelor of Science degree from the University of Mumbai with a major in Chemistry. She was the recipient of a Dr. Pai Scholarship for Excellence in her Bachelor’s degree. Her drive to imbibe knowledge beyond her major led to her receiving a State Scholarship for Graduate Excellence Examination which recognizes students for their proficiency in physical sciences and social sciences. Pooja earned her Master of Science degree from the University of Mumbai where her research project involved Synthesis and Studies of complexes of Rare Earth Elements with Organic Ligands. During this time, she also represented the University of Mumbai on various platforms such as television media, seminars, and talks. Pooja has extensive experience training students for the SAT and her students are currently enrolled in undergraduate degree programs in universities such as Tufts University and the University of Birmingham. Pooja’s intent to be trained as a convergent and divergent thinker coupled with interests in scientific questions led her to pursue doctoral research. Pooja is now enrolled for her doctoral program at the City University of New York under the mentorship of Dr. Eisele and has been part of The Eisele Research Group since April 2018. She is passionate about understanding the self-assembly processes and will be focusing on the self-assembly of peptides – light-harvesting materials. Dominik is the lab’s spectroscopy lab technician since September 2018. Dominik graduated from the City College of New York with a B.Sc. in Physics, specializing in optics and photonics, in May of 2018. This native New Yorker has been a part of the Eisele group since Fall of 2017, expressing strong interests in microfluidics, photochemistry, and photophysics. Over time, his curiosity for science became more aligned with those of Dr. Christopher Leishman, our post-doctoral molecular spectroscopist. Since September 1st, Dominik spends his time mastering the Femtosecond Solid-State Laser System (FSSLS) found in the second floor spectroscopy lab. Starting up the FSSLS and routinely maintaining the equipment, aligning optical elements throughout each section of the FSSLS, installing peripheral optical equipment, and learning about nonlinear optics, represent just a fraction of the tasks that have made his passion for optics and chemical physics flourish here at the Eisele group! Saad grew up in Queens, NYC. Saad began his undergraduate career at the City College of New York in September 2015 pursuing a major in Biochemistry. Saad joined the Eisele group in April 2016. In Fall of 2015, Saad joined the CCNY chapter of Engineers without Borders and contributed to the adoption of their new project in Nicaragua. In Spring 2016, Saad was elected Event Coordinator of the CCNY chapter of Engineers without Borders. Giancarlo was born and raised in Bronx, New York. In 2015, he started his undergraduate studies at the Grove School of Engineering at The City College of New York as a chemical engineering major. In January 2018, he joined the Eisele research group, where he assists the researchers with lab work. Joe McManus is pursuing a B.E. in Chemical Engineering at the City College of New York. He grew up in Denver, Colorado and received a B.S. from the School of Communication at Northwestern University. He previously worked in politics and public policy with the Roosevelt Institute and Obama for America. His concentration is chemical solutions for energy storage. He is excited to help the Eisele Group study self-assembling light-harvesting nanotubes. Although she has spent the majority of her life in Fairfax, Virginia, Joy still has a soft spot for past homes in Kentucky and South Korea. She attends the Gallatin School at New York University in the class of 2021, where she plans to form a concentration based on nanotechnology and neuroethics. Joy joined the Eisele Group in early 2018 and works under the kind tutelage of Kara Ng. Matthew was raised in Queens, New York. An undergraduate student at City College of New York, he intends to pursue a combined B.S./M.S. degree in Chemistry. In April 2018, he joined the Eisele group and is currently working with Dr. Nikunj. Firdaus was born in India and moved to the United States in 2008. She is currently an undergraduate engineering student at the City College of New York. She joined the Eisele group in June 2018 and has recently been assigned her own project to discover the bio-functionalization of metal nanoparticles. With a background in DNA Barcoding she hopes to find a consensus between two disciplines. Noah A. Hovde born and raised in Piermont, NY began his undergraduate education at Manhattan College as a Chemical Engineering Major. He transferred after just one semester to the City College of New York and switched his major to Physics. Hovde intends to complete his B.S. in Physics and, upon graduating, pursue a Ph.D. in a related field to Applied Physics. Here at the Eisele group, he assists Dr. Leishman with research using the femtosecond laser system in the spectroscopy and photonics laboratory. Nermin was born and raised in Alexandria, Egypt. Currently, she is a senior undergraduate student pursuing a Biology major and Chemistry minor at The City College of New York (CCNY). She is always interested in discovering and getting valuable experience in the field of science. Apart from her academics, she tutors General Chemistry at CCNY. Nermin is pleased that she will be extending and summarizing her knowledge in a field relative to her study at the Eisele Group. In November 2018, Nermin joined the Eisele Group. She is now working with graduate student, Pooja Gaikwad. In January 2019, Danielle has been accepted to the ERG as an undergraduate researcher. She was born in Brooklyn, NY. Previously, she studied at Baruch College to obtain a B.B.A. in Accountancy with a minor concentration in Communications. Danielle has worked as an accountant and project manager in the alternative asset management industry for over a decade, at international banks, hedge funds, and private equity funds. Danielle dedicates her spare time to homeless outreach with The Bowery Mission and Don’t Walk By in New York City. She also has mentored young girls in various mentorship groups in Brooklyn, NY and served as a leader with the kid’s ministry at her church. Currently, Danielle is further exploring her passion for numbers and ‘how things work’ in her pursuit of a second degree in applied mathematics and engineering. She aims to develop solutions to issues dear to her, such as awareness of educational and financial resources in economically challenged communities, and research for renewable energy resources. In November 2019, Karisma has been accepted in the ERG as an undergraduate researcher. Karisma was born in New York and raised in East Stroudsburg, Pennsylvania. She began her undergraduate career at New York Institute of Technology, majoring in computer science. Upon discovering her passion for chemistry, she transferred to the rigorous science program at The City College of New York. As an undergraduate student at CCNY, she aspires to earn a Bachelor of Science degree in Biochemistry, and to apply for a Ph.D in a chemistry‐related field. After completing her studies, Karisma plans to do research alongside passionate scientists in different countries. In the ERG, she is working in the team of the doctoral researcher Kara Ng. Partaking in research has helped her develop skills such as working in a lab setting, utilizing advanced tools, and applying her knowledge to practice. Born and raised in Kazakhstan, Altynay is a native Russian and Kazakh speaker. She received her B.S. degree in Biology from the prestigious Korea Advanced Institute of Science and Technology (KAIST), South Korea. In June 2018, she became a member of the Eisele Group. With her team, Altynay is working on The Eisele Group’s educational outreach projects aiming to educate the public about the importance of fundamental research. Currently, she serves as the Eisele Group’s Outreach Production Manager and leads the group’s Video Production Team. This project is funded by the Eisele Group’s 2018 NSF Career Award. Jin was born in China. He received his polymer science bachelor’s degree from Ningbo institutue of technology, Zhejiang University in May 2016. He completed his Master’s Degree in Material Science at Stevens Institute of Technology after two years of studies. During his master studies, he investigated substrate surfaces affect on the formation of bacterial biofilm and observed the bacterial adhesion interaction surface using Scanning Electron Microscope (SEM), confocal microscope, optical upright microscope, and optical invert microscope. He joined Professor Eisele’s research group on Oct. 2018 as a visiting Research Associate. He works on nano-scale assembling polymer particles for sensing and biomedical applications. In this work, he is intended to study shape, size, surface functionality and tailored properties of the nano-scale polymer particles. He is planning to further study for a Ph.D. degree. Michael Chin was born and raised in New York City, where he graduated from The City College of New York with a Bachelors in Political Science. Michael joined CCNY’s The City Tutors, which is a community organization focused on training volunteer tutors who support talented students from disadvantaged backgrounds. Partners of The City Tutors are educational programs from all over New York. Currently, The City Tutors trains their tutors to support students from partner organizations from across four of the five boroughs of New York City. In general, with their organization, The City Tutors create a unique opportunity to support both the students and their volunteer tutors, the latter of which receive hands-on career development opportunities through the diverse tutoring programs. The City Tutors are based at CCNY’s Colin Powell School for Civic and Global Leadership. Currently, Michael serves as the Educational Assistant as well as the Tutor & Training Coordinator of The City Tutors. In the Summer of 2017, The Eisele Group had the chance to begin a fruitful and long-term collaboration with The City Tutors. Michael became an important part of the Eisele Group’s educational outreach projects and at the beginning of 2018, the Eisele Group was able to strengthen the successful collaboration with The City Tutors by providing partial funding for Michael’s position. Jennifer is a Macaulay Honors College student pursuing a double major in Biochemistry and Psychology. She hopes to go to medical school after graduating from City College and focus on neuroscience. Jennifer is a virtual tutor for Profesor Eisele’s chemistry class. She became a tutor because she enjoys the idea of students helping each other make an intensive college course more comfortable and less stressful. She hopes she will develop leadership and public speaking skills through tutoring. Dolon was born and brought up in Calcutta, India. In 2007, she received her Bachelor in Biotechnology from University of Pune, India. In 2009, she received her Master in Biotechnology from Bangalore University, India. As part of her undergraduate curriculum, she participated in a research project on typhoid in mice and became fascinated with research. In 2010, building upon the success in her undergraduate research, Dolon became a research assistant at Indian Institute of Toxicology Research, India. At IITR, Dolon had was able to develop COPD mice models and studied signaling molecules associated with inflammatory pathways in COPD. In 2012, she joined the research lab of Prof. Gerald Koudelka at SUNY, Buffalo, as a graduate research assistant and received her Ph.D. in Biology in August 2017. The Koudelka lab focuses on pathogenic E. coli outbreaks; during her graduate studies, Dolon successfully identified complex phage-encoded proteins regulating the severity of these not-well understood outbreaks. In August 2017, Dolon joined the Eisele Research Group as Prof. Eisele’s Educational Assistant. Dolon is part of the Pilot Program of the Eisele Research Group and CCNY’s The City Tutors (http://www.thecitytutors.com/) that aims gaining first experience & preliminary results for a newly established educational project: the Chemistry Mentorship Project (CMP) is initiated by The City Tutors aiming to support students with their transition from high-school to college. This project focuses in particular on students from minority and underrepresented groups and will therefore, contribute to CCNY’s mission as one of America’s most diverse, minority-serving, public institutions with public purpose. Keylin was born and raised in Brooklyn, New York, where she is currently a rising junior at Brooklyn Technical High School. Since being introduced to physics in her freshman year, Keylin has decided to pursue a career in physics. Currently, she’s a high school student researcher in the Eisele Group and mentored by our doctoral researcher Pooja Gaikwad. For her research project, Keylin is learning to synthesize porphyrin nanotubes, self-assembled under different solution conditions. Her 2018 summer research project is kindly supported by CCNY’s NSF-CREST Center for Interface Design and Engineered Assembly of Low-dimensional Systems (IDEALS),. Whenever she’s not in the lab, Keylin loves to spend her time reading or playing the violin. Currently at Lehman College, M.S. Ed.